A lifetime ago I used to enjoy bike riding. Nothing strenuous, just moseying around at a relaxed pace. Every so often I think about starting up again. We seem to have accumulated a fair amount of bicycles over the years. Lloyd bought two at a yard sale to fix up, but we never rode them. 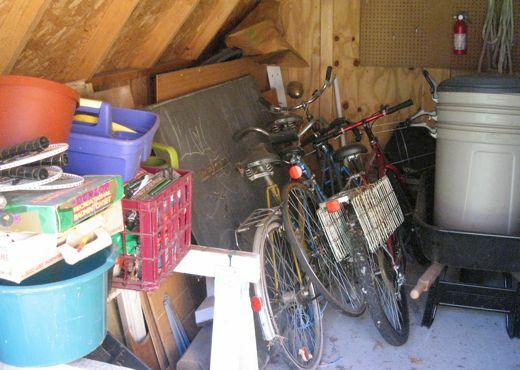 Brad has a cool tandem bike in our shed that would be awesome to fix up and ride – it will never get done. Two years ago I bought my neighbor’s bike that had two flat tires. I’ve never fixed them. Maybe this will be the summer that it happens. I hauled the latest one out of the shed on Sunday, washed off all the spider egg sacs (*jibblie*) and brought it into the basement. I wonder how long it will live down there? I’m almost certain that I should not replace those tire tubes myself. I could do the front tire, but the back tire involves gears which I’m sure to mess up. I’d like to have some sort of knowledgeable person do it so I don’t land on my face somewhere between here and work. Biking would be fun if it didn’t hurt my bum so much. Alternatively, you can buy a gel seat cover that is absolutely fabulous!!!! I call it my Big Mama seat. Hey, sis. 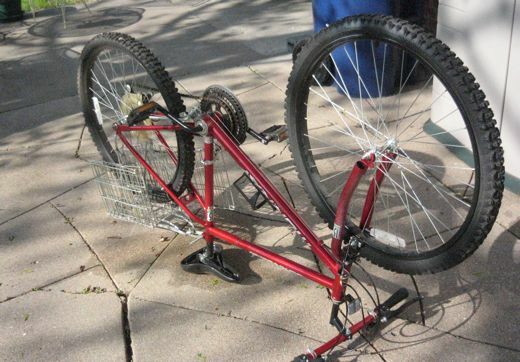 Why not haul that bike to a bike shop in Lincoln and ask them to show you how to change/repair the tire on the back wheel. That gear thingy is called a “derailer”, and I remember that on my bike it wasn’t that hard to get the wheel off. Then have them check/lubricate/repair the brake and shifter cables. It may cost you $30 to $50 to have this ‘tune up’ done, but it will reassure you that the bike you’re riding isn’t going to fail you. Cables that sit a long time are notorious for corroding and sticking when you least expect. Ask if they’ll teach you how to do this stuff and then you can go back home and practice on all the remaining bikes in your shed! Oh, and have them properly gap the brake pads from the rims. That’s a two-wrench job and it needs to be done correctly. Whew. Just thinking about doing all that tired me out. Yeah, I’m thinking the Moose’s Tooth or Bike Peddlers is the way to go. Hey Lauren, if you want to save the money, I could show you how to do some of this. Also, Lauren, is your lawn mower shot or does it just need fixing? Also, if it is shot do you plan to sell it or just throw it away? Curt, I think it would be just right for you. It probably needs the spark-plug changed (or a new one) and one of the wheels occasionally fall off and the handle used to come apart (but that will NEVER happen again), but it worked fine for the first mowing of the season.